This USB-Câ„¢ to Mini-USB cable lets you connect your USB 2.0 peripheral devices to USB-C computers or car chargers. For example, you can connect your camera to a USB Type-Câ„¢ laptop or desktop computer and download your latest photos or videos. You could also connect your Mini-USB GPS to a USB-C car charger. 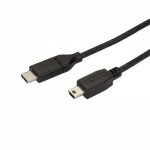 The USB2CMB2M from StarTech.com comes with a 2-year warranty for guaranteed reliability.